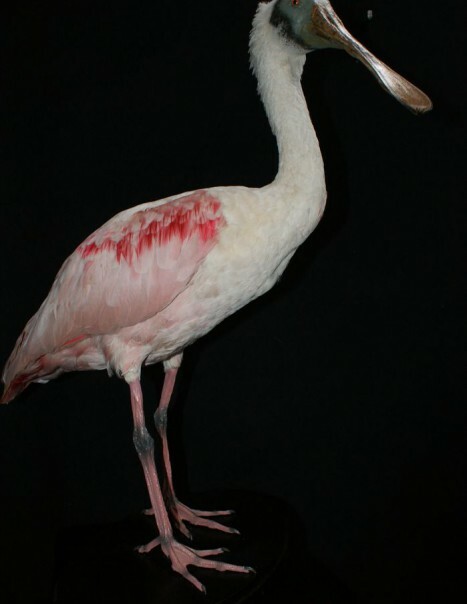 The roseate spoonbill is a species of aquatic bird of the Threskiornithidae family. It breeds mainly in South America, the Caribbean and on the coasts of the Gulf of Mexico to the United States. It nests in mangrove trees where it broods 2 to 5 eggs. This species is easily recognizable. It measures 80 centimeters high with a wingspan of 1.2 meters. It is a wading bird with long legs, long neck with a long beak-shaped spatula. Adults have a bare gray head, neck, chest and back are white, the rest of the plumage is dark pink. The beak is flat and gray. Both sexes are similar, but young people have the white head feathers and pink plumage is much clearer. The beak is yellowish or pinkish. Unlike herons, they fly with the extension neck. In 2006, they found a bird banded of 16 years old, the oldest known bird species. The species feeds in the shallow waters of fish, frogs and other aquatic animals. It feeds by walking in water, often in groups and by going with its beak in the water, from left to right and vice versa. This technique allows it to find food in the dark and muddy water through a secret tool: its beak is tactile! Thanks to this ingenious device, the pink spatula hunt small fish, amphibians or large aquatic insects that make up most of its diet.